Lights All Night recently announced the initial lineup for its massive three-day New Year’s Eve festival. Taking place at Fair Park in Dallas on Dec. 29th-31st, LAN will host Tiësto, Avicii, Bassnectar, Calvin Harris, Axwell, Diplo, Ghostland Observatory, Flux Pavilion, Nero DJ set, Alesso, Zeds Dead, A-Trak, Sander van Doorn, Markus Schulz, Zedd, Madeon and more. 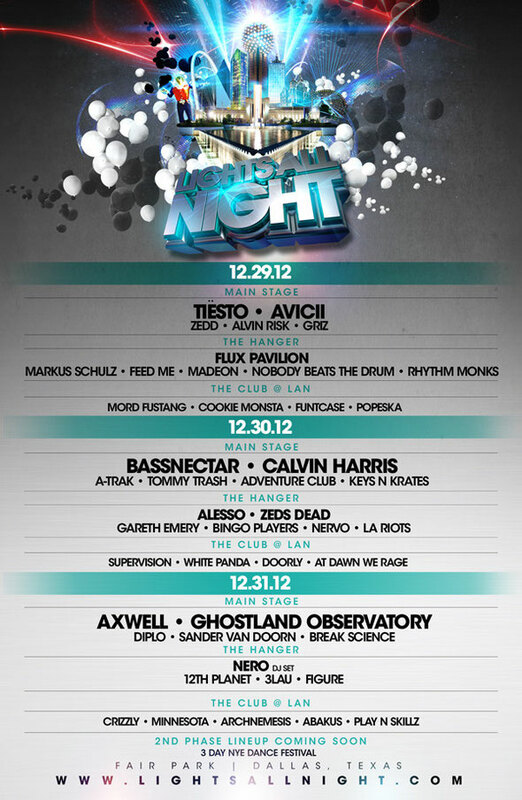 VIP and General Admission tickets are currently on sale and can be purchased via www.lightsallnight.com. With premier electronic artists, state-of-the-art production, dynamic lightshows, live dancers, and art installations, Lights All Night should once again serve as one of the destination New Year’s Eve events for electronic music fans across the US. Organisers recently announced too that Highland Entertainment and Australian based international concert promoter, Chugg Entertainment will partner together to produce the Dallas based Electronic Dance Music festival, Lights All Night in multiple global markets. The inaugural Lights All Night event to be produced collaboratively by the two companies will take place in Australia in 2013, with exact locations and timings to be specified at a later date.